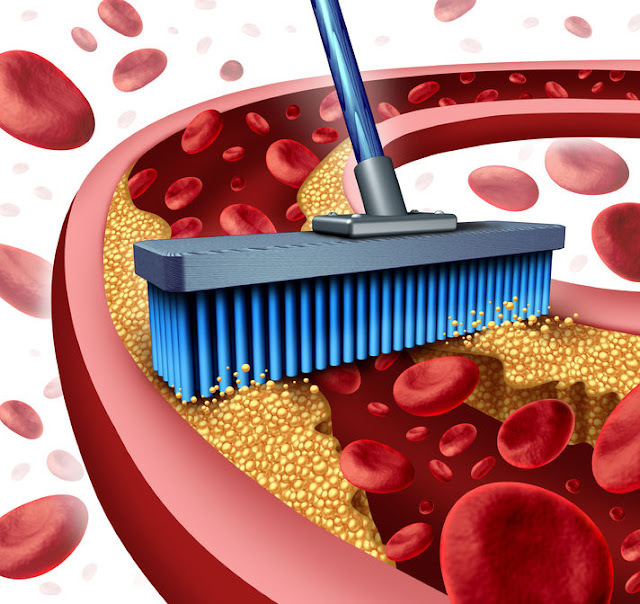 In this post, you’ll learn how to completely clean your arteries, thus avoid all of these health problems. You’ve probably heard that following a well-balanced diet is beneficial for the heart health, and the Mediterranean one has shown to be the best diet plan for this purpose. It’s abundant in antioxidants, unsaturated fats, and fiber. People living in the Mediterranean region usually enjoy whole grains, seafood, fish, legumes, nuts, olive oil, small portions of chicken and lean meat, and limited amounts of eggs, red meat, sweets, and butter. This diet includes more veggies and fruits than the typical American diet. If you eat this heart-supporting diet, you can reduce your triglycerides and cholesterol, normalize your blood sugar, and lower the risk of heart disease. According to the American Heart Association, your trans and saturated fats should be restricted to 5-6 percent of your daily calories, which is around 13 g. for a 2,000 calorie diet. They also recommend consuming more polyunsaturated and monounsaturated fats. In other words, you should avoid cheese, butter, cream, donuts, cakes, cookies, and other baked goods that contain harmful trans fats. You should focus on fatty fish like sardines and salmon, and unsalted seeds and nuts. When it comes to red meats, always choose the leanest cuts. Consuming too much salt, especially the processed table one, can increase your blood pressure and block your arteries. But, sugar is even more harmful as it can contribute to high blood sugar, cholesterol, and obesity. The American Heart Association explains that the daily consumption of sugar for women should be not more than 100 calories or 6 teaspoons of sugar, whereas for men – 150 calories or 9 teaspoons. A serving of fresh, antioxidant-packed fruits can satisfy your cravings for sweets. -Oats and Chickpeas – Oats and chickpeas contain soluble fiber which attaches to the cholesterol in the digestive system and remove it, preventing it from going into your arteries. According to studies, they can reduce total and bad, LDL cholesterol without affecting the good, HDL cholesterol. -Pomegranates – The results of one research conducted on carotid artery disease patients, showed that the group which was given pomegranate juice for a period of one year marked reduced blood pressure and lowered arterial thickening by up to 30 percent. On the other hand, the participants from the other group had increase in the arterial thickening by 9 percent. According to researchers, the positive results in the first group are thanks to the antioxidants present in pomegranates. -Nuts – If you consume 50-100 grams of nuts, like walnuts, pecans, and almond, at least 5 times a week, you will drastically lower your total and LDL cholesterol levels. What’s more, nuts are even better option that a low-fat diet when it comes to heart health. -Herbs – Herbs beneficial for your cholesterol balance are guggul, calamus, turmeric, saffron, myrrh, and safflower. These herbs are also beneficial for treating arteriosclerosis. Combination of garlic and honey I also good for reducing cholesterol levels. Garlic – This vegetable contains sulfur compounds which reduce cholesterol levels. One study showed that consuming garlic for a period of 6 to 8 months can reduce triglycerides and serum cholesterol, as well as increase the good cholesterol in both, healthy individuals and those with coronary heart disease. Avocado – Avocados are loaded with antioxidant vitamins A, C, and E, soluble fiber and monounsaturated fats which reduce total and LDL cholesterol, while raising the good, HDL cholesterol. To keep your triglyceride and cholesterol levels well balanced, exercise at least half an hour a day, 5 times weekly. Combine low-intensity resistance training such as pushups, with moderate-intensity aerobic exercise like cycling or brisk walking. If your levels of cholesterol are already high, replace the low-intensity resistance training with medium- or high-intensity training. If you’re a beginner, you may start with yoga which is as good as aerobic exercise for the heart. Yoga can reduce your bad cholesterol levels, blood pressure, and help the weight loss process. The secret is its stress-reducing abilities that will help you relax. Sleep is not only good for reducing your bad cholesterol, but for almost every aspect of your health. Lack of sleep has been related to obesity, as it affects the balance of the hormones that regulate the hunger – leptin and ghrelin. This deadly habit is responsible for 1 out of 3 deaths caused by cardiovascular disease. Cigarette smoke contains harmful chemicals which can cause inflammation of the cells that line blood vessels. Moreover, smoking can reduce the good cholesterol levels and promote plaque formation. If you stop smoking, you have chance to undo some of the caused damage. For instance, the risk of heart attack will significantly reduce within a year of quitting, whereas within 5 years, the risk of stroke will be the same as that of a non-smoker.